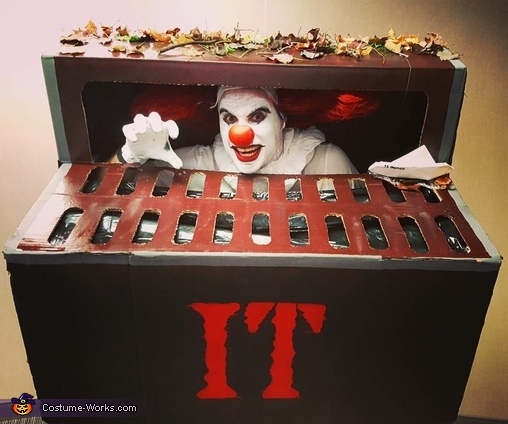 With the resurrection of the classic film "IT" this year, I assumed many people would attempt this costume. However, I knew no one would attempt the costume from the iconic scene where Georgie's boat falls the sewer and we see IT for the first time. Therefore, I decided to take on creating a wearable sewer and grate and have myself as IT in the sewer. I created the sewer out of cardboard, yard sticks to ensure structural integrity, and a lot of Elmer's glue and tape. I measured sewer grates in the street and reviewed scenes from the original movie to ensure I captured realistic measurements and look. Lastly, I included actual leaves, an origami version of Georgie's boat, and a red balloon to capture those additional details. For the face makeup, I bought a makeup set for clowns which included white and black crayons to draw the makeup on in addition to a clown wig which I spray painted red. I hope you like it and it inspires you to think outside the box (no pun intended).